I looked far and wide for eyeball candy. 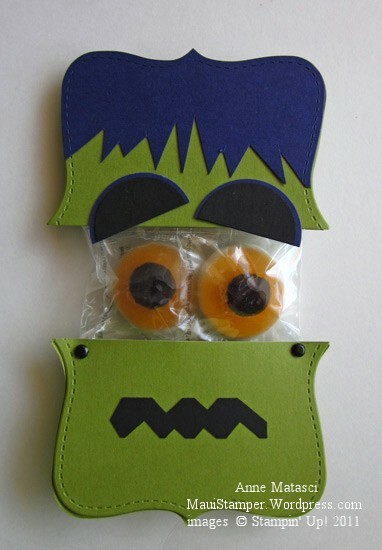 The sample that inspired me had foil wrapped chocolates with eyeballs printed on the foil, but I couldn’t find those anywhere on Maui. We’re basically a small town on an island. We have a few Big Box stores and our grocery stores and a number of smaller shops, but we don’t have the Target Dollar Spot or the huge selection that larger Mainland towns have. What’s more, because shipping takes time and money, things arrive – and sell out – in a hap-hazard fashion. The rule here is if you see it, buy it – because next time it won’t be there. I saw these (gross) eyeballs and jumped on them. (Quit laughing, I didn’t really put them on the ground and stomp – you know what I mean!) They were a perfect solution for me because they’re those revolting gummy candies that I am not tempted to eat at all. (OK, true confession, I ate one just to be sure. They are disgusting.) This is not the case with M&M’s or Reese’s Pieces or (especially) Ghiradelli squares. Look at Frankie’s mouth. He tried one too.